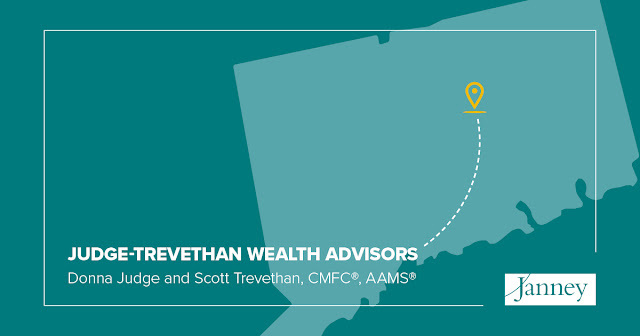 About Janney: Press Releases: Judge-Trevethan Wealth Advisors Join Janney in Glastonbury, Conn.
PHILADELPHIA – April 1, 2019 – Janney Montgomery Scott LLC, a leading full-service wealth management, financial services, and investment banking firm, today announced that Judge-Trevethan Wealth Advisors has joined the firm in Glastonbury, Connecticut. The team is led by veteran advisors Donna Judge, Executive Vice President/Wealth Management, and Scott Trevethan, First Vice President/Wealth Management. Rachel Sorrentino is also joining Janney as a Senior Registered Private Client Associate. Judge-Trevethan Wealth Advisors was previously affiliated with Wells Fargo Advisors. “Donna and Scott are significant and valuable additions to the Janney team in the region. They bring a vast amount of wealth management experience and a commitment to providing a high level of personalized service to clients. We’re pleased to welcome the team to the firm,” said George Keith, Senior Vice President/ Connecticut Complex Manager. Ms. Judge has been helping clients address their financial dreams and goals for more than 30 years and was recently recognized by Forbes as a Best-In-State Wealth Advisor. She is actively involved in her community, hosting events and fundraising for numerous local charities, including nonprofits benefiting our military and promoting financial literacy for women. Mr. Trevethan began his career in the financial services industry in 1993. He holds the advanced designations of Chartered Mutual Fund Counselor and Accredited Asset Management Specialist. He is actively involved in his community and serves on the board of the TCOP Foundation, a family charitable organization. He has a strong passion for coaching youth athletics, which includes athletes who have competed on a regional and national level in hockey and tennis. Ms. Sorrentino has been in the financial services industry for over 20 years. In addition to obtaining her securities licenses, she is a graduate of the University of Connecticut with a Bachelor’s Degree in Economics and has her Masters of Business Administration through Southern New Hampshire University. Janney’s Glastonbury Branch Office is located at 180 Glastonbury Boulevard. Suite 302. Glastonbury, CT 06033.